Collection of recyclables and compostables at home is frequent but still rare in public places because of the high costs associated with the replacement of public waste bins by new containers having 2 or 3 compartments. Thinking about this problem, Equilibri-Vie has developed the EcoloTOP concept based on a new idea: «Expand the collection of recyclables and compostables in public places or buildings through the transformation of various existing waste bins into new two-compartments containers for separate collection of recyclables (or compostables) and trash». To go green with EcoloTOP products, there is no need to change the public waste bins but just their lids! 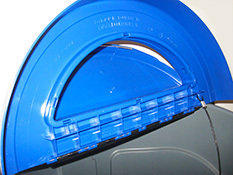 EcoloTOP is a practical lid easy to install for the selective collection of waste. It is available in different sizes to be compatible with a wide variety of existing public waste bins. 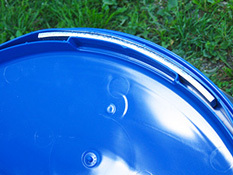 It is made of highly resistant and durable recycled / recyclable plastics (HDPE) and metal parts. EcoloTOP is entirely manufactured in Quebec (Canada) under stringent quality control. EcoloTOP is very cost effective compared to buying and installing new waste receptacles with compartments. EcoloTOP, 100% green since its origins.